Whether or not this victory for East Fife over Greenock Morton could be considered a 'cup shock' is open for debate. Given East Fife have already beaten Queen of the South and Partick Thistle in cup competition this season, and full-time Raith Rovers twice in the league, the side has already proven itself against so called bigger teams. 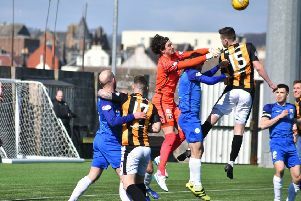 There was no chance Greenock Morton could have underestimate their hosts on Saturday afternoon, they were simply beaten by a better, hungrier team. Victories like this for clubs such as East Fife, putting them through to the last 16 of the Scottish Cup, are massive financially. The players did themselves and the club proud with yet another brilliant cup performance. It was made all the more impressive given they had to come from behind to secure it. This was a proper cup tie, played at a magnificent pace. Both sides came flying out the traps early on but it was the visitors who grabbed the game's opening goal. Jack Iredale impressed all game with his excellent deliveries, the first of which set-up Bob McHugh for a simple tap in from close range. But East Fife responded well, and were behind for a matter of minutes. They went straight up the park and won a corner. From it Liam Watt managed to work the ball to Anton Dowds who netted from close range. Play raged from end to end, with both sides having chances to get their noses in front. Scott Agnew went close at one end, with McHugh dangerous at the other. The second half followed the same pattern as the first in what was an exciting cup encounter. Both managers shuffled their packs to try and get their noses in front - but it was Darren Young's side who would grab the crucial third goal. Again Morton were unable to deal with an East Fife corner and the loose ball broke kindly to Craig Watson a few yards from goal. The defender couldn't miss, and lashed his strike into the Morton net. Boss Young said: “We’ve beaten three Championship sides in cup competitions now and managed to beat Raith twice who are a full-time team. “That says a lot about the guys’ fitness, desire and workrate. “We have a really good squad and every game we can bring three guys on from the bench and their attitude and desire to go on and do well is great."